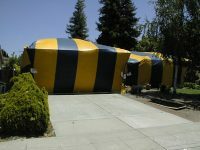 If you think fumigation is the only way to get rid of termites in your home in Solana Beach, California, you may be happy to discover that there is an alternative. At Kilter Termite and Pest Control, we use KILGUARD, which is an advanced termite control system that doesn’t require many of the inconveniences associated with whole-house tenting. For example, unlike fumigation, there are no fumes or noxious odors with our system, so you won’t have to leave your home and spend additional money on alternative accommodations. In fact, you won’t even have to bag up your food and medications. Most importantly, Kilter’s termite control system is proven effective. And, unlike fumigation, it doesn’t allow subterranean termites to simply burrow underground only to return once treatment is complete. We’re so confident that we’ll be able to rid your home of termites and keep them from returning that we provide a two-year warranty. For effective termite control service for your home in Solana Beach, CA, that doesn’t involve fumigation, contact Kilter Termite and Pest Control today.